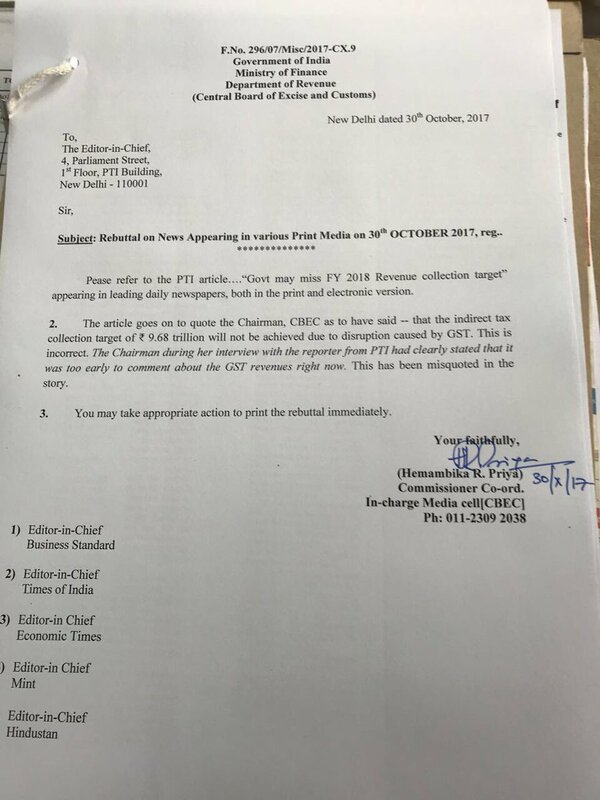 Home Fact-Check PTI has misquote the CBEC chief on GST collection targets? Just a week ago, PTI had reported that Revenue Secretary Hasmukh Adhia had acknowledged that a “complete overhauling” of GST was required. This news was met with criticism on social media, as political potshots ensued. Later, Adhia claimed that PTI had misquoted him. He said that he had said only GST rate structure needed some rejig. Soon, PTI changed all their reports and updated the same. This statement was a departure from recent remarks made by persons in the Government and other information in public domain. GST collections had a very good start in July. Finance Minister Jaitley had said just a month ago that GST collections were set to surge in the coming months. A report by Swiss brokerage UBS Securities too had said that GST collection worries misplaced. It remains to be seen whether PTI will once again update their report and accept their folly. In the recent past, PTI has regularly been caught on the wrong foot. In July, PTI spread fake news about the UP education budget. Later, PTI was caught passing off old pictures as pictures of Ahmedabad airport being flooded. In August, PTI was found using a ‘derogatory’ image in one of its reports. For the last two incidents, I & B Minister Smriti Irani had rebuked PTI on social media.